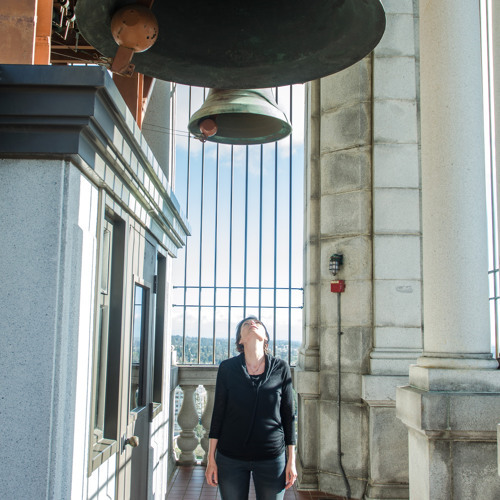 Live performance of WE, a piece composed by Agnes Szelag, performed by Jeff Davis, and recorded by The Norman Conquest on March 10th, 2015 at UC Berkeley Sather Tower Bells (The Class of 1928 Carillon). It was also simultaneously broadcast on KALX radio. http://newscenter.berkeley.edu/2015/03/09/staffers-carillon-composition-debuts-march-10/ WE (2015) A public space provides possibilities for the exchange of ideas and the communication of dreams and desires. In creating WE, I considered the clarity and purity of bells as instruments, but also the historical context of towers as an apparatus used to send a message. I wondered how well this device could work today to communicate an idea, and what symbolic relationship there was to the reach that the University has to communities in the Bay Area. The music is the result of contemplation on the concept of WE, our individual ideas about WE, and the tension between the individual and the WE. What do you envision when you think of WE? What do WE look like in the future? Do you envision a utopian or dystopian society? How do WE connect with people who didn’t make it into that picture? How do WE connect with community members that are very different from us in class, race, sexual identification, gender and legal status? What role does the University play in creating channels of communication and connecting resources? What role does the University play in protecting the future of vulnerable groups, arts and humanities, and other non-commercial interests? Most importantly, how does the University send out a clear message about that role? The music was created in short, song-like fragments that represent the individual. The fragments are interspersed by chords that represent the abstract concept of WE. When put together, are the fragments connected or disconnected by the WE? Does the song and rhythm of the individual transform as it becomes a part of the WE? It up to listener to decide if the chords (systems of the WE) disrupt or connect the voices of the individuals. Perhaps the strength of the WE has potential to lift the individual. The performance of the piece is being broadcast live on KALX radio. This element creates more tension as the broadcast music will be time-delayed depending on the listener's location, and the frequency range of the bells will be altered depending on the listening device [radio? car? internet?]. People close to the University will have the opportunity to listen in a place where you can simultaneously hear the bell tower itself and the delayed, broadcast version. This situation speaks to the idea of messages of the individual not being heard exactly as intended and that the WE is always a part of what the individual does. There is no escape from intentional and unintentional disruption, and there is no escape from our messages being filtered, repeated, and altered by various media. It also questions the reach that the University actually has in the community and how altered its messages get as the original source of the communication gets more distant. My grandmother, Bronislawa Szelag died a week prior and I dedicated the performance to her.